If it’s Valentine’s Day, that means it’s time for only one thing: A night of romantic experimental films! For February, the monthly Flaherty Seminar screenings at the Anthology Film Archives is dedicated to all things love; including brand new videos by Jacqueline Goss and Peggy Ahwesh, and a classic, rare documentary by Tony Ganz and Rhody Streeter from 1971. This event will be moderated by programmer and filmmaker Penny Lane. (Who does not have a film in the lineup herself.) Lane will also host a post-screening Q&A with several of the filmmakers who will be in attendance. 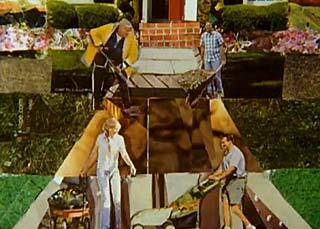 Some of the highlights include the full 28-minute cut-out animated musical Yard Work Is Hard Work by Jodie Mack. You can watch a toe-tapping, exuberant excerpt from this film below. (Or watch in full online.) Plus, Honeymoon Hotel by Tony Ganz and Rhody Streeter is a rare 1971 documentary where newlyweds are interviewed at one of those crazily decorated places in Pennylvania’s Poconos resort area.